There are numerous types of ham to be found on the market. Iberico ham is one of the best known. Serrano ham is any type of cured ham from the white pig. Cooked or sweet ham is what we all know as York ham. There are different factors that determine the types of ham. First, there is the breed of pig from which it comes. White or Iberico ham. The food the pig eats also involves different types of ham. 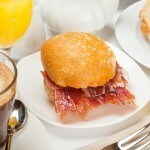 Acorn-fed ham is an Iberian pig fed a very high percentage of during the fattening period. 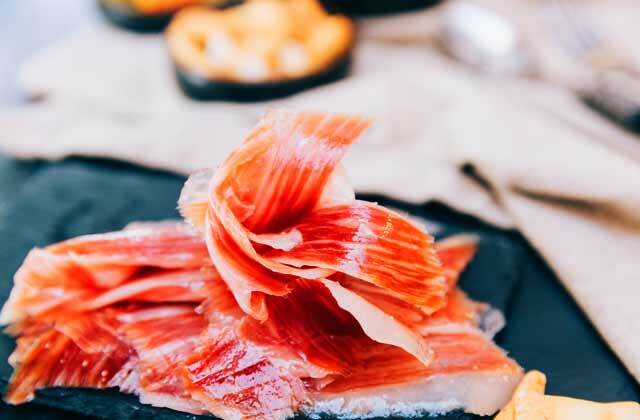 Among connoisseurs and on restaurants’ menus, the name of Serrano ham is used to mean that which comes from a white pig that has not been fed pine cones. This is the cheapest and lowest quality. Another factor that plays a part in the variety of white cured ham is the curation time. The longer the curation the better the quality. The minimum is 9 months, if it has lasted 15 or more months, we will obtain a mixed ham with minimal quality. When we talk about Serrano ham as a generic name, we are also talking about cured ham using the salting method. 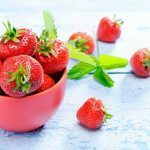 An ancient process used to prolong the preservation of food; very useful when there were no modern methods to refrigerate or freeze food. The origin of ham and the place where the pig was raised and the ham were prepared are also considered when putting together the list of ham types. Something that also leads to different denominations of origin. 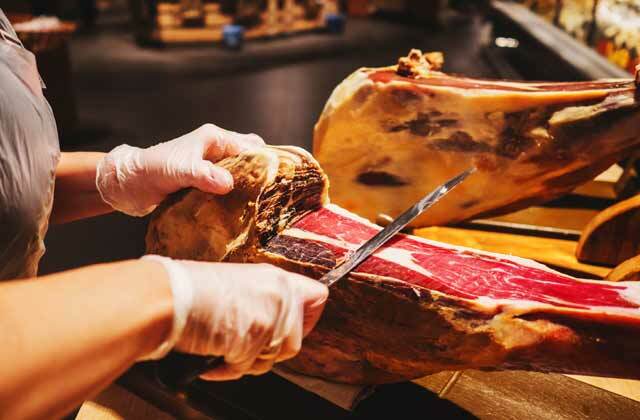 As other gastronomic products like wine or olive oil, there are hams of different Denominations of Origin. Jabugo Designation of Origin ham is one of the most appreciated for his high quality. Ham is one of those gastronomic products with a long-standing tradition in Spain in general and in Andalusia in particular. Its origins go far back in time, as much as the consumption of pork meat. Legend has it that cured ham came about by accident, when shepherds roasted a pig that had died when it fell into a creek with a high concentration of salt. They tasted the roasted meat and discovered that the hind legs were the tastiest. The documented historical origin dates back to the last 2nd century BC, in the time of the Roman Empire, which is when the first written references to the practices of salting and preservation of pork can be found and the use of these techniques in Spain is mentioned. The way in which the pig is sacrificed and cut up, and the meat is salted and dried is still the one that is used today. Traditionally, the procedure begins with the slaughter in the last months of the year to take advantage of low temperatures in order to carry out the rest of the process. Lovers of cured ham are usually connoisseurs of different types of ham. They can even tell the variety of ham before tasting it. The aroma, colour and texture are different in each case. These differences are very evident between cured Serrano ham and cured Iberico ham. Not all Serrano hams are the same, nor are Iberico hams of the same quality. 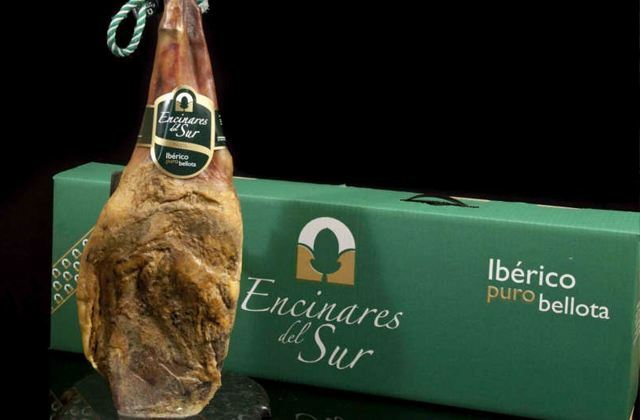 To start classifying this product there are two basic divisions: serrano ham and Iberian ham. From here you just have to enjoy every one of its varieties. 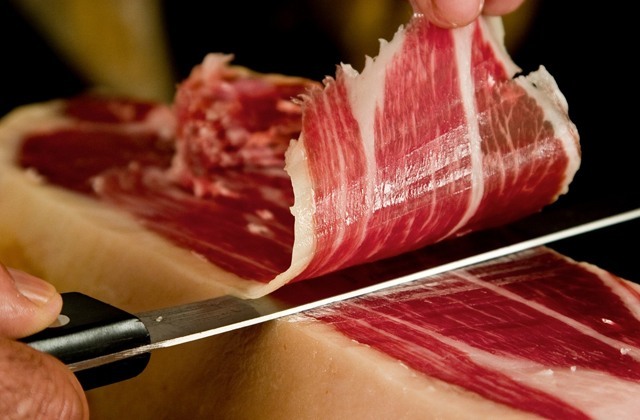 Iberian ham comes from pigs also called with the same name and is especially found in Andalusian pastures. 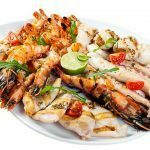 All of these type of animals live in freedom, an essential element for them to exercise which will then have an impact in the quality of each slice. Depending on the food the pig received we can obtain different varieties in the taste. 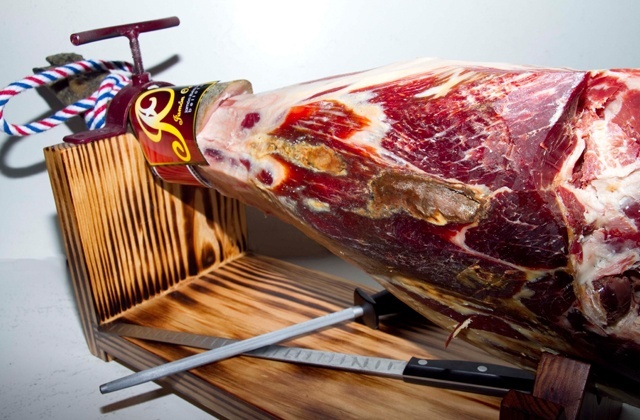 100% acorn-fed Iberico ham is one of the most appreciated varieties. Other hams that are also exquisite come from pigs whose race is Iberico to a lesser degree and have fed on acorns, grains and natural grass to different degrees. The animal feeds on acorns during its lifetime. This ham is the finest that exists in the market and, in turn, the most expensive. The animal feeds from natural grass and fodder. Whatever your favourite type of Iberian ham, this is the most coveted by lovers of this food, so you must try it. Do not leave Andalusia without experiencing this explosion of flavours and if you can, accompany it with a good Andalusian wine. Serrano ham comes from white pigs and their diet is based on fodder derived from cereals. In this case the range depends on the curing time. 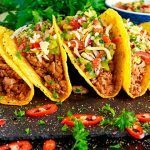 This delicacy is more widespread and it is often used for sandwiches at breakfast (the most popular one with oil and tomato) or for other recipes as an additional ingredient such as gazpacho, sauteed mushrooms, or any stuffing or garnish for other meat. The European Union recognises a series of varieties of cured ham through different brands. Different officials ensure the compliance of characteristics of the product relating to the breed, the place where the pig is raised, the place where it is fed, the type of food the animal receives and the place where it is prepared. Jabugo Protected Designation of Origin (Jabugo DOP). A distinction certifying the origin and quality of hams and back legs of Iberico breed pigs raised and fattened in the pasture. It also certifies that they have been prepared in natural warehouses in the towns of the Sierra de Aracena and Picos de Aroche. 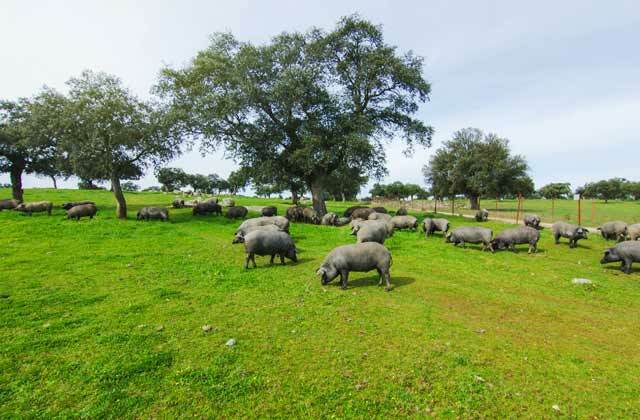 The production and fattening zone of Iberico pigs of the Jabugo DOP are the holm oak, cork tree and gall oak pastures of the provinces of Badajoz, Cáceres, Córdoba, Huelva, Seville, Cadiz and Malaga. The preparation zone of hams and back legs with Jabugo DOP is limited to the 31 towns of the Sierra de Aracena and Picos de Aroche. Los Pedroches Protected Designation of Origin (Los Pedroches DOP). The production, fattening and preparation of the Iberico hams and back legs with this designation coincide. Holm oak, cork tree and gall oak pastures located in specific municipalities in the north of Córdoba province. Some of them are Pozoblanco, Torrecampo, Pedroche, Bélmez, etc, with over 30 in total. 100% acorn-fed Iberico. Pieces of 100% Iberico pigs, whose final pre-slaughter fattening was based exclusively on acorns and grass. Acorn-fed Iberico. Unlike the above, in this case, the pieces come from pigs with 75% genetic Iberico breed. Dry lot feeding. This variety comprises two categories: 100% Iberico dry lot feeding and 75% Iberico dry lot feeding. In both cases, the final pre-slaughter fattening of the pig is carried out on its pastures, based on the natural substances thereof and natural grains prepared with grains and pulses. This other type of ham that is produced in Andalusia and guaranteed by Protected Geographical Indication (IGP) Certification. The pieces of this type of ham come from white pigs of three races: Landrace, Large-White and Duroc-Jersey, pigs that have been fed on plant feeding stuffs. 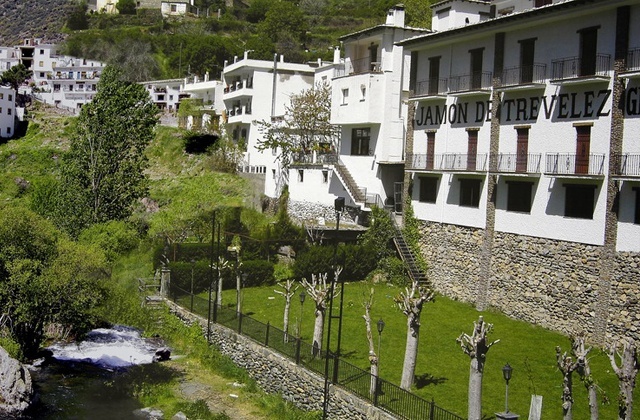 IGP hams are prepared in different municipalities of Granada province. 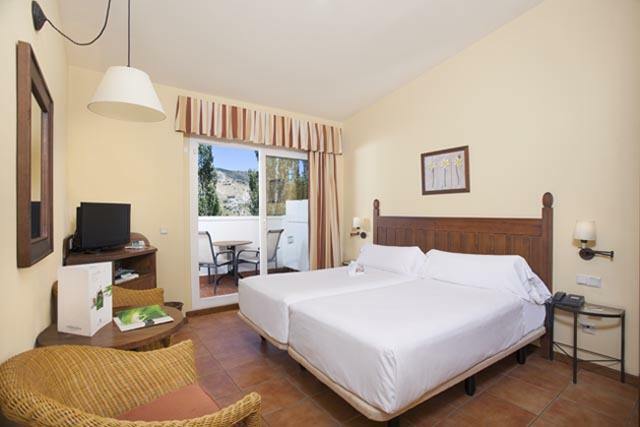 Territories located on the south side of the Sierra Nevada, in the high part of Alpujarra and inside the Sierra Nevada Natural Park. All these at a height over 3,937 feet. The hams are cured in a natural manner. The curation period is a minimum of 14 months and a maximum of 20. You can taste different types of ham anywhere in Andalusia. 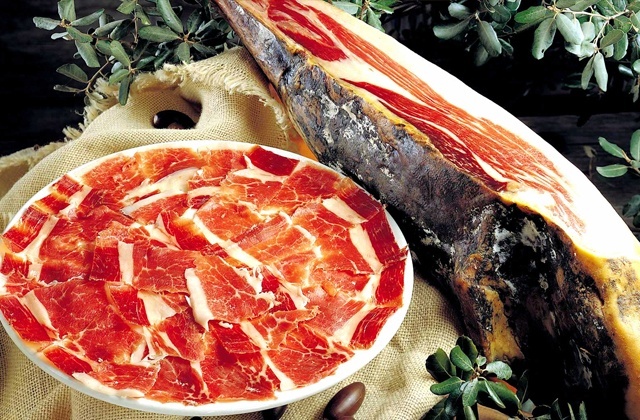 Huelva province is the producer of the most internationally renowned ham. Those of Jabugo province are the most famous. As in the case of hams from Córdoba or Granada province, not all are the same. Jabugo DOP hams can only be sold by companies who have acquired this right. Currently, these companies are in the municipalities of Aracena, Aroche, Corteconcepción, Cortegana, Cumbres Mayores, Jabugo and Santa Olalla del Cala. They are distributed from their warehouses, for sale to other national and international territories. 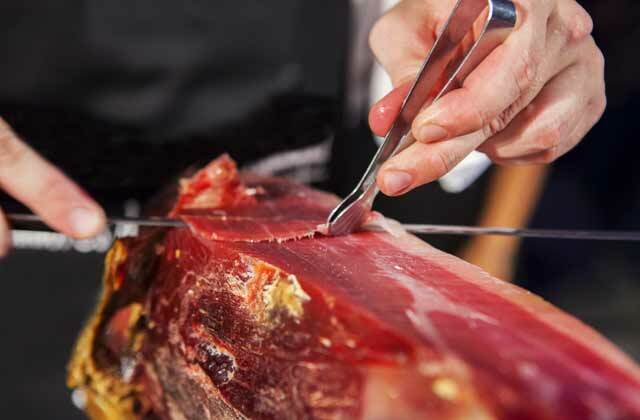 Cutting ham well is essential for enjoying this traditional Andalusian delicacy. A top-quality ham can lose some of its valuable properties if it is not carved professionally. Carving ham is quite an art. The skill of ham carver is among the most respected in select restaurants and gastronomic establishments. A good professional with this skill is as valued as a good sommelier. There are international ham carving schools and competitions to choose the best ham carvers. Enjoying thin slices of carved ham is one of the greatest gastronomic pleasures, accompanied by a good red or white wine, or a good beer, and a slice of good bread or with traditional bread sticks. This is the simplest way and for many most exquisite way of eating ham. But there are hundreds of recipes that include ham as an ingredient. And who has not eaten a huge and sandwich of top quality ham? 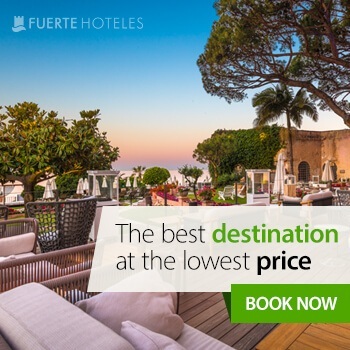 If you want to try what many consider the best ham in the world, the best place to stay is the Hotel Fuerte El Rompido. 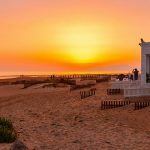 You will find it in one the most unique places on the Huelva coast, at the mouth of the River Piedra. A privileged natural setting to savour Jabugo Designation of Origin Ham, and you can accompany it with some of the area’s famous wines.